Ever since the E-Sign Act was passed, many businesses and individuals have turned to electronic signatures. Let’s explore some electronic signatures benefits, and how they can help your business, too. If you are considering e-signatures for your business needs, this technology is sure to make your business operate more efficiently and make your life easier. Here are some of the things that you will quickly learn for yourself as you begin using electronic signatures. Electronic signature can allow your office to go paperless. Documents requiring signature are one of the few reasons businesses still have printers and fax machines. What’s the need for paper when signatures can be obtained online? This is not only environmentally friendly, but will also help keep the office better organized and provide a more inviting work environment for you and your employees. You will save lots of time by using electronic signatures. How? Your deals and transactions will be almost instantaneous, completed with just a click or two of the mouse. You will also save the money that is currently spent on paper, ink, envelopes, stamps, and all the supplies need for printing and mailing contracts and other documents. More important areas of the business can then receive more attention, thus increasing your revenue. Likewise, if you are the customer who is signing a contract, electronic signatures will save you the time and frustration of signing a contract and looking around for a fax machine or stamp to return the signed contract. Electronic signatures offer a greater sense of security to both parties in an agreement, as most electronic signature providers allow the parties involved to store and view the contract and associated audit and authentication data in a secure online archive. This also eliminates the risk of losing important records and paperwork through misplacement. Based on these benefits, it is no surprise to see a majority of businesses implementing electronic signatures. In the near future, most businesses that are still doing things the old way will join the paperless revolution. Maintain your competitiveness, and don’t be the last one to make the change! Kevin Moore has been writing articles on various online technologies including web applications for business, cloud computing and electronic signature technology. His articles on the latest innovative technology tools including digital signature have been published on various blogs and websites. Yes, i did the change! My accountant has taken all that was necessary and now the thinks are more easy to do and i like it. I recommend to all! 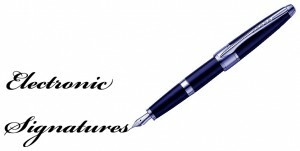 I want to get an electronic signature for different purposes. I think it’s cool. Using electronic signature is cool. But what about the storage of the signing keys? Inside the computer or some cryptography container such as USB Token or Smartcard? Yes, your point should be considered while signing up with an electronic signature provider. The leading e-signature providers incorporate the most advanced security solutions, giving you the same level of data protection and redundancy as an online bank. Your connection after login is secure and encrypted using industry-leading SSL technology. The data storage on Amazon S3 data centers is accessible only via SSL encrypted endpoints, ensuring your data cannot be viewed or compromised in transit from your internet node to the AWS secured facility. In addition, a firewall with default deny mode and definitive traffic restrictions protects your data in storage. SSL, Cloud Computing….All technology stuff and I love it. Would it be too costly for a normal user to own an electronic signature feature? Counting as well the cost of purchasing the device and also not to forget the digital certificates that is required to be presented upon signing. Also if I am not mistaken, digital certificates will expire at most every two years and the renewal could be another cost as well? Is it not so possible on normal user? I have e-signature, but I don’t use it all the time and still prefer to have usual one, but electronic one when I need to send some papers quickly abroad and they should be signed. Great Article Kevin. Go Green with Electronic Signatures because it encourages paperless revolution. Great idea Naser, use electronic signatures to help you go green and save the planet! I have an electronic signatures from echosign, but i doubt it’s got any legal power, it’s just something written by a piece of software, it’s not like a manually written signature where you can be identified by the way you write. I see the issue. I am sure there is some way to make them legally binding. Yes, all e-signatures are not legally valid. The law requires e-signature to fulfill certain criteria for being admissible in court. Oh really? Is that the same in all countries do you know? A lot of companies, even though they’re trying to go for a paperless office, are still uncomfortable with implementing e-signature. In my view, whether we like it or not, this is going to be how things are done in the future. The traditional signature will most likely be reserved to legal documents, like contracts and such.